- We congratulate you on occasion of your appointment to this position. Please tell us about yourself. - Thank you. I was born in Baku in 1981. I received my secondary education in Baku, then I studied at the bachelor’s and master’s degree programs of the International Law and International Relations faculty at the Baku State University with a degree in International Relations. Since 2002, I have been working in the Ministry of Foreign Affairs. During my years in the ministry, I worked on issues of such spheres as the regional security, the participation of Azerbaijan in regional organizations, in particular, the relations of cooperation with these organizations in the political and security spheres. I have worked in the Mission of the Republic of Azerbaijan to NATO, I have carried out diplomatic activities in the Embassy of the Republic of Azerbaijan to the Kingdom of Belgium and the Grand Duchy of Luxembourg and the Mission of the Republic of Azerbaijan to the EU. Prior to this appointment, I was Deputy Director at the Azerbaijan International Development Agency (AIDA) under the Ministry of Foreign Affairs. I am married and have two children. - What can you tell about your work in the Ministry of Foreign Affairs and diplomatic missions abroad? 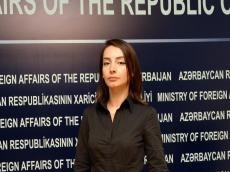 - Attaining multilateral foreign policy goals based on national interests, carried out by Azerbaijan under the leadership of the head of state in the existing complex geo-strategic situation is the duty of every Azerbaijani diplomat, and during my years in the Ministry of Foreign Affairs, as well as in the diplomatic missions abroad, I, as a diplomat, tried to adequately fulfill this duty.